Yesterday's BarcampCHS 4 was a pretty successful event. Almost 300 attendees and about 50 sessions on a pretty broad range of topics. 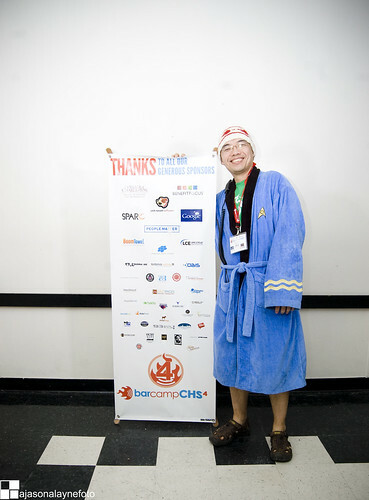 I didn't get too many pictures from Barcamp this year. Had my little Sony camera, but I kept forgetting I had it so all I got were a few pictures from the session pitching. Registration took a while and there was some initial confusion. That ended up pushing the schedule back an hour, but despite that it sounded like everybody who attended had a good time. I offered up three sessions (trimmed down from the original 4). Because of that I didn't make it to any of the other sessions I wanted to see. I did make it to an Intro to Arduino session which was pretty cool. I think that might be my next fun thing to get into. Next year I'll probably just do one or two sessions. My CT Scanners: How do they work had more people show up than I was expecting. Unfortunately I had forgotten to put my presentation on Google Drive, so I had no slides to present. I ended up having to ramble on and give my presentation mostly from memory and without much in the way of visual aids. I did get a few questions though and there were some people that seemed pretty interested. The next session was my History of Computers Museum. The original idea was to have people bring some of their old/ancient hardware and have kind of a show and tell, and reminisce about the "old days". Clay McCauley brought a bunch of his old gear, including an old and still functioning Apple ][+ (boy did that bring back memories). I had forgotten the stuff I was planning to bring though, but another person brought some old portables he had, like a Sinclair ZX80 and a couple of old Radio Shack portables. Google Guy (Eric Wages) was there, which made things a little intimidating. It turned out to be a pretty good session. Without a lot of advance publication and notice, it's an idea that probably doesn't work all that well for a Barcamp session though. Eric asked if there was anything like a Computer History Museum in the area. AFAIK there isn't one, but it seems like it might be an interesting thing to put together. My How to Become a Ham Radio Operator was the most attended of my sessions, with about 15 people or so. My presentation took about 30 minutes, which left about 30 minutes for a general "HamCamp" type discussion. Fortunately there were 4 other amateur radio operators that I knew who helped answer questions. Turned into a pretty good discussion and it seemed like the other people got quite a bit out of it. Hopefully some of them will be prompted to take the test and become licensed. Overall, another great BarcampCHS event and from what people have been saying on the social medias, more Barcamp converts for next year.